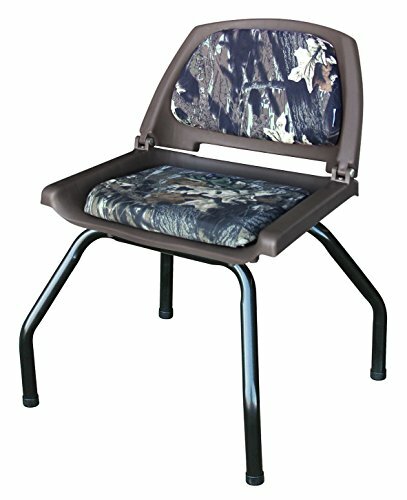 Wise folding padded seat and solid seat stand combo - perfect for hunting, fishing, Pre-Game events at the stadium, deer hunting, Duck blinds, turkey hunts. Seat swivel included for comfortable seating position. Seat stand is constructed of black powder coated, 14 gauge steel with rubber foot caps included. 5 1/4 inch seat swivel hole pattern fits most seats. Stand has 350 lb. Maximum weight capacity. 5 year warranty on seat frame, 1 year warranty on upholstery, 3 year warranty on seat stand. Seat stand dimensions: height: 13", width: 19.25", depth: 18.25". seat dimensions: height: 15.75", width: 20.25", depth: 19.75"
Overall height: 29", seat cushion height: 18"
Seat Dimensions - Height: 15.75", Width: 20.25", Depth: 19.75", Seat Depth: 15.5"
Frame Height: 12.875" Width: 20.25" Depth: 18.5", Height with Stand to Top of Bottom Seat Cushion: 18", Total Height with Stand: 29"
If you have any questions about this product by Wise, contact us by completing and submitting the form below. If you are looking for a specif part number, please include it with your message.